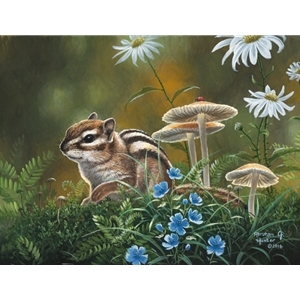 Chipmunks have always fascinated me. Imagine if humans could tuck away their food supply in their cheeks like chipmunks can! I mean let’s face it, chipmunks are cool. This cute little guy is hunting for food on the forest floor. This painting gave me a chance to study nature a lot closer to the earth than I usually paint, and I really enjoyed the experience.